Many of us find it daunting to think of challenging the status quo. It’s not easy to be the person who speaks up when everyone else is silent. When we think about what the status quo is—the existing order of things; present customs, practices, and power relations; the current state of affairs—it’s no wonder it can be daunting to offer a challenge. But I want to give all women a boost of confidence because women have been challenging the status quo for centuries! Women have been fighting for their rights to own property, to work, to vote. Think of the suffragettes in the U.S., who protested for almost 100 years before the 19thamendment was ratified in 1920, giving women across the US the right to vote. And today women continue to challenge the status quo, demanding equal pay, equal representation in the workplace, in the C-suite, and on boards. 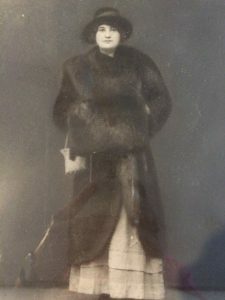 The author’s grandmother, Sarah Steinberg. My grandmother came to the US as a young woman in the early 20thcentury, escaping the pogroms in Eastern Europe. She spoke only Yiddish when she arrived and yet managed to make a successful life for herself, owning her own business, raising two children, putting my mother through college, and even buying her a Steinway grand piano when my mother was studying to be a concert pianist. My enduring memory of my Bubby was that she always spoke her mind, not always with the utmost finesse. When we would tell her she shouldn’t say something, she would smile, shrug her shoulders, and with her thick accent say, “somebody’s gotta tell them.” To this day, I can hear her speaking those words. If I hesitate to speak up about something I feel strongly about, I remember my Bubby and know that it’s important to speak up for what’s right. It’s uncomfortable to be the dissenting voice in the room because human beings are comfortable in groups of people who think like us. It’s easier to go along with the prevailing viewpoints. But we also know that adhering to the status quo can be a problem. We risk getting stuck in “group think,” where we miss important ideas and information. We know that businesses must challenge the status quo if they are to grow because growth requires change. 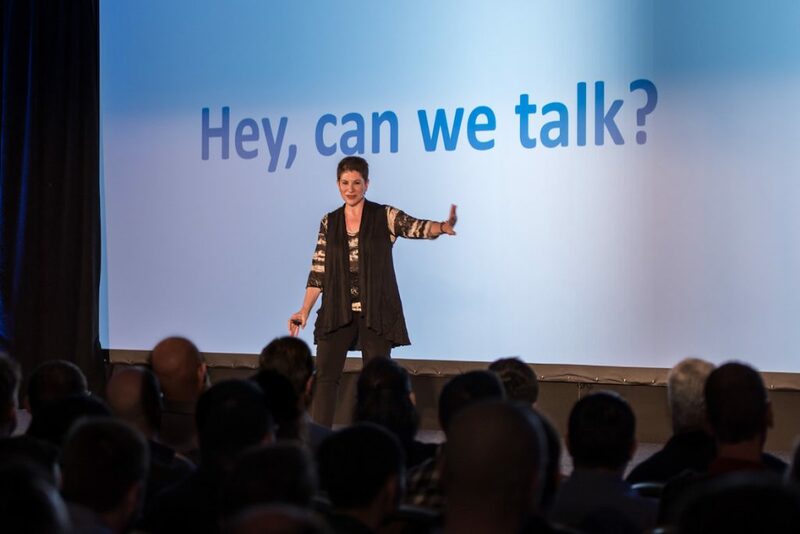 Minette Norman speaking on ‘Radical Empathy’ at the Autodesk Technical Summit in London, 2017. In his book The Diversity Bonus, Scott Page shares research showing that when a group brings in an outsider with a different perspective, that team doubles their chances of solving complex business problems. The newcomer interrupts the flow and makes the team less comfortable. We might think that the discomfort would make the team less effective, but the inverse is true: the discomfort helps the team break through to innovative solutions. At Autodesk, as we hire new employees or acquire new companies, we have the opportunity to leverage new ideas and new perspectives. But we must be open to hearing the new ideas, and that is not always the case. One of the reasons we often hesitate to challenge the status quo is that we know we will be met by defensiveness, and we don’t relish the idea of facing someone who is on the defensive. Too often when people get defensive, they attack the other person as their survival instinct takes over. It takes practice to challenge the status quo. In reflecting on times when I’ve been successful in speaking up with a challenge, I came up with a few principles. As I was thinking about these principles, I realized that they apply to both the person who is challenging and to the person being challenged. Challenge ideas, not people. Show that you care about the person and talk about the ideas. If you are the person being challenged, show respect and recognize that it took courage for this person to offer her point of view. Open your mind (and your heart). Be willing to learn something new. Inspire and encourage others to take a chance, to speak up and speak their own truth. Recently, I had a staff member challenge a conclusion I had reached in a way that did not trigger my defense mechanism. She listened intently to what I said. I saw her thinking about it, not speaking immediately. Then she said, “I’ve seen this from a different angle,” and explained how she viewed the issue. We then had a lively discussion in which she shared her thoughts and examples of what she’d experienced. In the course of the discussion, I realized that I had had a blind spot. It takes practice to challenge the status quo, just as it takes practice to learn how to be challenged without retreating into defensive behavior. But if we can practice and get more comfortable challenging the status quo, I’m convinced that we can evolve our workplaces, improve our society, and make a better world.